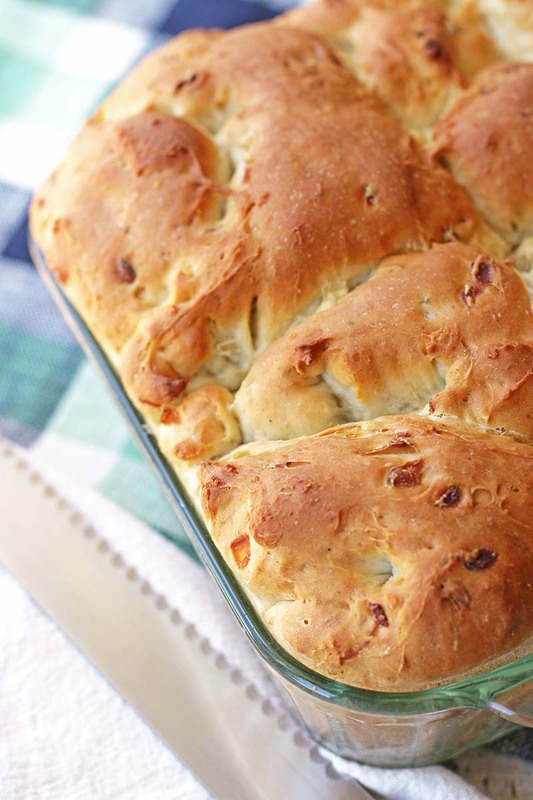 A casserole bread with all the flavor of herb stuffing. In large mixer bowl, combine 1½ cups flour, yeast, sugar, salt, sage, rosemary and thyme; mix well. In small skillet, sauté onion in butter until golden. Add to flour mixture. Add warm water (120-130°F) and egg. Blend at low speed until moistened; beat 3 minutes at medium speed. By hand, gradually stir in remaining flour to make a stiff batter. Spoon into greased 2-quart casserole. Cover; let rise in warm place until double, about 1 hour. Bake at 375°F for 35 to 40 minutes until golden brown. Remove from casserole; serve warm or cold. this recipe has been a family favorite since it appeared on the Red Star yeast package…and is a new favorite with the next generation! Just an aside: the first time I made this bread, we skipped the meal and ate just the bread…yes, it’s that good. can you give the measurements of a two quart casserole please? I have numerous bowls, not sure which one is correct. It depends on the shape and depth of your dish. A square 2 quart dish is about 9×9-inches. Check the bottom of the dish – it usually states the size. I have been looking for this recipe ever since 1975, when I found it on a yeast pkg, made it for thanksgiving dinner & loved it, but lost the recipe! So glad you publish these things – Thank you!